In my experience I would have to say yes. Many of us that have studied for and passed our certification exams feel that we would like to share what we have learned and how we learned it, so some write braindumps and others like myself create training lab scenarios. One of the tools I use when preparing for some of my exams is from a small Australian company called Visual CertExam. Many schools throughout the world are using this tool to create exams for their classes on a verity of subjects. The easy to use import feature of the exam designer has made it very popular among those people that originally created the braindump and they are using this tool to convert those braindumps into practice exams. The Visual Cert Exam Suite consists of two programs; a Manager and a Designer. According to VisualCertExam.com, the designer was developed “for authors involved in practice exam development” and the manager was “designed for taking exams created with Visual CertExam Designer”. One of the popular features of the designer is the ability to import and convert TXT, RTF, and PDF formats to the VCE format which is read by the program and displays the questions and answers in a format that is more like the actual exam. Is the Visual CertExam Manager a valid study Aid? I would have to say yes, as I use it to prepare for many of my exams. You can never take to many practices exams when preparing for a certification exam. Although I would not rely solely on this tool it can provide and inexpensive media to test yourself with practice questions that where created by people that have already taken and passed their own exams. 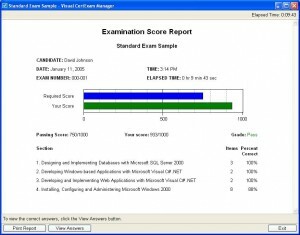 While there is a small onetime cost involved of less than thirty dollars for the Visual Cert Exam Suite, there are many websites out there that provide free exams that have been formatted to be used with this tool. One of my favorite sites is ExamCollection.com which has exams for Cisco, Microsoft, Novell, CompTIA, and many others. So in conclusion while free training aids like Visual CertExam should not be the only tool in your box when preparing for a certification exam, they are very useful, and the price is right.